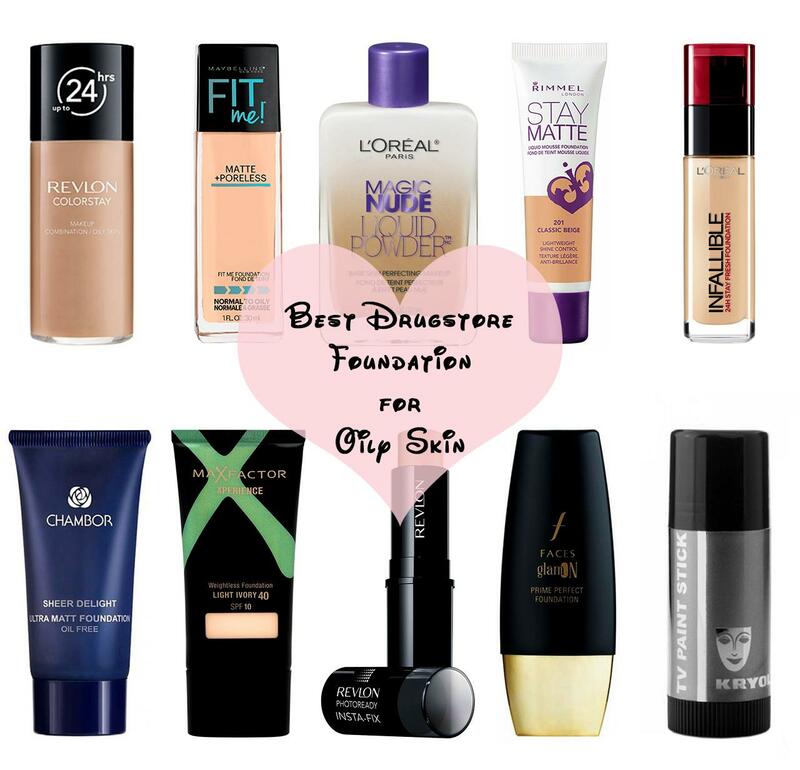 You guys asked me to do a post on best drugstore foundation for oily skin and I was like, well I’d do it perhaps when it’d be the right time so I thought what best time could it be than this mid-year when summers has just begun (and are at its peak) and you all must be in hunt for a good foundation (drugstore) for daily wear (ranging from light, medium to heavy coverage depending on what you want for your skin type) everything which has been covered in this post! I have compiled all the best drugstore foundations one can ever find in drugstore brands in India! This is hands down, one of the best drugstore foundations for combination to oily skin, it gives a flawless base and mattifies the skin yet feels light on the skin! If you are looking for a foundation that could last you a good time (a full night) without having to worry to touch up and something that gives medium to full coverage then this could be your best bet with the price it comes at! It also photographs well even with flash since it doesn’t come with spf [(you probably know SPF ruins the picture clicked with a flash), the Indian version doesn’t come with SPF but the US version has SPF 6] The shade range is a bummer with only 3 shades in India compared to US which has 11 shades ? The ‘fit me’ range is the most raved about range from Maybelline by all beauty gurus and this is why I had to include the Fit Me foundation in the category of best drugstore foundation for oily skin! This foundation is great for everyday wear, it mattifies the skin, gives medium coverage and lasts for around 5-6 hours which is pretty good! It doesn’t feel like you are wearing a heavy makeup, that makes it a perfect everyday wear option for combination to oily skin since it feels so light on the skin! It comes in 6 shade, the lightest shade being has slight pink undertone and rest all 5 shades with yellow undertone, there is also a shade for dusky skinned beauties so you can most probably find your match in this! Don’t be confused by the term ‘liquid powder foundation‘, it just means that this foundation turns from a liquid consistency to a powder finish making it super apt for oily skin! It is super light, gives light to medium coverage and sets into a matte finish. Again this is a good option for everyday wear and for someone who is looking for a foundation with not much coverage and something that sets into a matte finish, you gotta try this out! This again comes in 6 shades so yeah a thumbs up for it ? Are you all about light weight foundation with medium coverage but haven’t found your perfect match yet? Then your search could end here with this light weight Rimmel foundation which has a perfect matte finish to make it in the list of best drugstore foundations for oily skin! Oily skinned girls swear by it and think this foundation to be one of the best drugstore foundations not only in India but worldwide! It is matte (of course, why would it be in the list then? ? ), light weight, easily blendable, it’s got a cream consistency so it’s much easier to work with and with 5 shades to choose from, I’m sure you can find your match in this! Not to mention, it lasts for 7-8 hours (some even says it lasts for 9-10 hours) without touching up (now that’s pretty good for the price it comes at)! This foundation is good for normal, combination to oily skin types! The price is a bit high for a drugstore foundation I admit but it’s worth to be included in the list of best drugstore foundation for oily skin like Aish and Sonam always say, you’re worth it ? (not worth the money you spend on it but worth the product you get, if you know what I mean, *sarcasm) This foundation is thick in texture but blends out well and sets to a matte finish! It gives medium to buildable coverage which can be made to full by layering it and with a concealer on top, it gives a good full coverage look! The foundation comes in 11 shades with both pink and yellow undertones and with both light and darker shades suitable for Indian skin tones (now that’s commendable)! What’s more? It even photographs well as it doesn’t come with an SPF and stays put for around 6-7 hours! This will be a great special occasion wear foundation! This foundation is super light weight, easily blendable gives a perfect airy, light to medium coverage with semi matte finish. This is a perfect foundation for daily wear or for someone who has a 9 to 5 job as it stays fresh for 8-9 hours (requires one touchup in between if you tend to get too oily but nothing much that a blotting paper or a pressed powder can’t take care of)! There are 3 shades in the range all with yellow undertone, I know the shade selection is limited but still you gotta work it out if you are looking for something of this kind! With medium coverage, suitable for sensitive, combo to oily skin types, this foundation made it to the list of best drugstore foundations for oily skin! The foundation is light weight, gives a matte finish (which can be a lil demi matte after sometime) and stays put for around 7-8 hours! This foundation has SPF 10 but it still photographs well under flash and is a great foundation overall! This makeup stick is awesome for oily skin, the finish is semi matte when it goes on to the skin but soon sets to matte and keeps skin looking matte for around 7 hours! It gives medium to buildable coverage, the texture being slightly thick as with all stick foundations is still easier to work with, you can even use the darkest shade in this stick foundation as a contour stick coz the texture is so good to work up with as a contouring product besides being equally good as a foundation that you can’t resist yourself from buying two shades of it- one for your skin tone and one for contouring your face! 4 shades to choose from (quite limited), if you wanna buy it for contouring, I think Golden beige would be perfect for that but you still gotta test it out by swatching it and see if it’s two shades darker than your skin tone! The medium coverage foundation with 5 shades to choose from with most shades being warm yellow undertone makes this foundation perfect for Indian skin complexion! The texture being slightly thick is still easier to work with and the finish is semi matte, you can top it up with a pressed powder to make it look completely matte, it keeps skin shine free for 4-5 hours and it stays put for around 6-7 hours! If you are you looking for a full coverage foundation for parties, wedding or a night out or for your bridal trousseau, something that stays put for around 9-10 hours and cover up all your imperfections, then Kryolan TV paint stick could be your best choice (in drugstore not to forget), this is the best drugstore foundation with full coverage and is great for oily, acne prone skin! It is great for brides-to-be to be worn on your special day. The texture is slightly heavy so make sure not to go overboard with it or else it can get cakey! I would advise to keep this foundation only for special occasions when you need full coverage since it’s not good as a daily wear foundation as it can clog the pores and can feel heavy for day to day wear but for any special occasion when you want to look flawless, this would be great! Its got over 120 shades (now that’s ah-mazing, you sure shot can find your match in this be it you are super light, super dark, you have warm, cool or neutral undertone no matter what your skin and undertone is, there is a shade for you in it)! Until next time, bye byee, love you all ? Very detailed and nice compilation. Check on Nykaa, Purplle or Amazon, not sure where it would be available offline at your place! Previous Previous post: Spice Up Your Lips With Maybelline Spiced Up Baby Lips! Next Next post: Best Sunscreens for Oily Skin in India!